ISIS Papyrus Open House 2014: Customers are people! I was pleased to be invited to the ISIS Papyrus Open House and User Conference held on June 19th at their UK head office. This year, there was a strong focus throughout the presentations on customer experience and how the ISIS Papyrus solutions can bring that to life. Max Pucher is always an interesting and provocative speaker, so, for me, his sessions were the highlight of the day. He spoke about how much talk there is of Customer Service in all sorts of businesses, yet so little understanding of what it actually is. With Customer Experience an emerging buzzword, this seems at odds with many businesses’ focus on data, technology and process. Max reminded us that while efficiency is important, effectiveness must always come first. He said that customer experience starts with business objectives and that what you promise, creates an expectation. Satisfying customers can’t be done by mass marketing and loyalty/retention is only achieved by emotional connections. This cannot be achieved by automation or “cool apps”. Max’s presentation reminded me of Jan Carlzon’ s “Moments of Truth” which was one of THE books on customer service when it was first published in 1987. It seems bizarre that, a quarter of a century later, many businesses still haven’t realised that what happens at customer touch-points is key to success. The ISIS Papyrus approach focuses on creating software solutions that allow customer service interactions to be highly efficient and effective, without being highly automated, cold and inhumane. 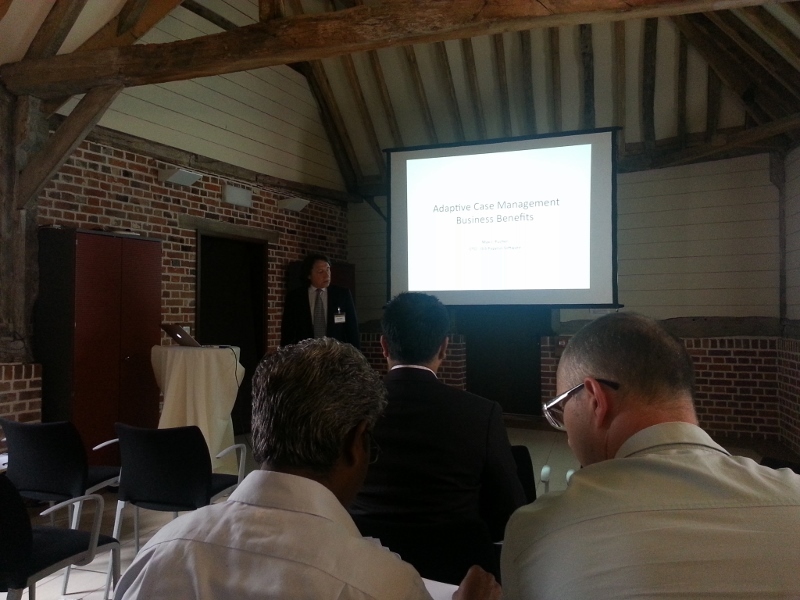 Max also returned to one of his fundamental principles in his second presentation; that of Adaptive Case Management (ACM). His slide (below) clearly explains how there is a spectrum of process types and that emergent processes require Adaptive Case Management, not rigid process management. ACM is what is needed when processes are unstructured; they are driven by rules and ad-hoc content arrival, such as scans, e-mail or social media. A flowchart simply isn’t adequate for describing how these processes operate. I’ve written before about the key differences between “routine” and “emergent” processes and also about ACM. It was particularly good to hear a customer case study this year. Andy Jackson from NFU Mutual described a couple of projects from the 21 year relationship NFU Mutual has had with ISIS Papyrus. One project addressed the printing needs of 300 offices processing 15000 documents per day. The ISIS solution helped reduce costs and improved service. A second project addressed the need to produce timely and accurate life product anniversary statements (100,000 per year). This 9 month project improved workflow and introduced ACM as well as improving regulatory compliance. It has delivered process efficiency savings and, importantly, has been a strategic building block that will enable future projects. Read more about Isis-Papyrus Process Automation and an overview of the Isis Papyrus approach. « Should you lead or manage your project’s kick-off meeting?